Liza Goldberg is 25, Jewish and bulimic. She lives with her gay roommate, Harvey, and hangs out with her good friend, another gay man named Tom. 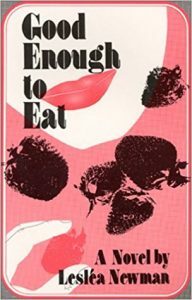 As Liza discovers the wonderful world of women and her own luscious lesbian sexuality, she makes peace with her body and her relationship to food. The kettle whistled and the front door slammed at the same time. Liza shut the stove and took her favorite mug down from the shelf. It was made of white porcelain with a little ceramic frog squatting inside at the bottom. She covered the frog with a teaspoon of instant coffee and then dumped a packet of Sweet and Low on its head. She poured hot water into the mug, then opened the refrigerator to get out the milk. I’ll just look around a little, she told herself, moving Harvey’s cottage cheese aside. Looking can’t hurt. What’s this? There was a little something wrapped in tin foil snuggled up to Harvey’s fruit cocktail. Liza picked it up and held it in the palm of one hand. It felt solid, like a baseball. What could it be? Liza unwrapped the tin foil slowly. It was a partially eaten kasha knish from the deli. I’ll just smell it, Liza thought, lifting the the food up to her nose. Ummm. She shut her eyes. It smelled like her whole childhood. She could just see her grandmother standing in the kitchen in her old flowered housecoat rolling out the dough, and she could just see her grandmother’s grandmother’s grandmother standing in her kitchen…wait a minute. Did they even have kitchens back then? Liza was getting a little carried away with herself. She opened her eyes and looked at the piece of pastry. I’m really losing my mind, she thought to herself. After all, a knish is just a knish.